So if you're like me, you've got at least a couple leftover cans of pumpkin floating around from Thanksgiving. After picking my brain over what to do with them (cake? muffins? loaf? ), I realized I wanted to do something different, something that wasn't a dessert. Lo and behold, the savory, hearty, pumpkin pasta recipe! Unbelievably quick and easy, this dish is a perfect fall or winter meal. And not just because it's filling, but because it's got all the flavors of the season. Subtle but sweet pumpkin, strong woodsy sage, pungent garlic. 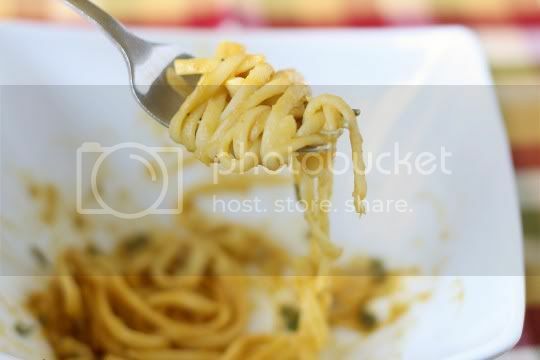 The sauce is creamy and rich, and thickens considerably once it's added to the pasta where it nicely coats each noodle. The nutritional yeast adds savory undertones and a slight saltiness, but you will need to season the dish with salt (and freshly ground pepper!) to your liking. I used almond milk for the creaminess, but you can probably substitute soy or rice, just make sure it's unsweetened. However, I would highly suggest almond for its texture, natural nuttiness, and ability to best blend with the other ingredients and flavors. To really increase the nutty flavors, try using a whole-wheat pasta, or even adding some toasted walnuts! One more great thing about this dish is its nutritional content. Relatively low in calories (for a pasta dish) and fat, it's super high in fiber and protein. Perfect for post-holiday eating! Bring a large pot of salted water to a boil. Add pasta and cook until al dente (7 to 8 minutes); drain. Meanwhile, mince the shallot, garlic, and sage. Heat olive oil in the pasta pot over medium heat. Add the shallot and garlic; stir for 3 minutes until softened. Add the pumpkin puree, vegetable broth, almond milk, nutritional yeast, and half of the sage. Reduce heat to medium-low and cook for 10 minutes, stirring frequently, until the sauce is slightly thickened and reduced. Season with salt and pepper to taste. Add the pasta to the sauce, and mix well. Sprinkle each serving with the remaining sage. Serves 4. This looks delicious! I love healthy and tasty recipes to make for dinner and I can't wait to make this one :). Love that its vegan too! This sounds ymmmy. I am not vegan but still often eat that way. Can I sub reg milk and is the Nutritional yeast just for a nutritional boost or will leaving it out affect the recipe? 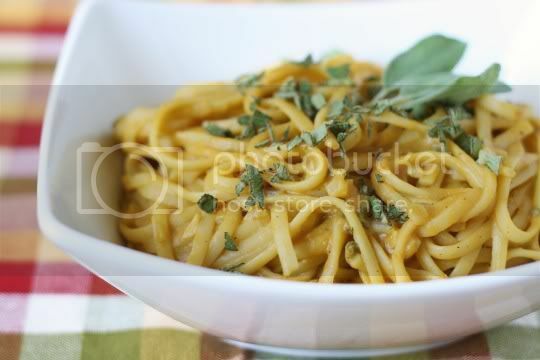 I was looking for a veggie pasta recipe using pumpkin (which I love) until now!. Thanks! to2sassy: Check out the original recipe from which this one was adapted, it uses regular milk, chicken broth, and Parmesan cheese instead of the nutritional yeast. Or, you probably could leave out the nutritional yeast, it just adds a nice savory undertone. that pasta looks amazing! simple and delicious! wow, i am totally making this this week. how do you think dried sage would do? I have a can of pumpkin on my shelf right now and was thinking just what to do with it. I think I have sage too! I'm gonna try this for sure, thanks! Beautiful pasta. What a great use for pumpkin! Wow!! I made this for lunch today and is was incredible!! I followed your recipe but threw in some fresh cooked chickpeas to add a little protein.. yum!! Pinned it and posted it on Facebook b/c it soooo good!!! 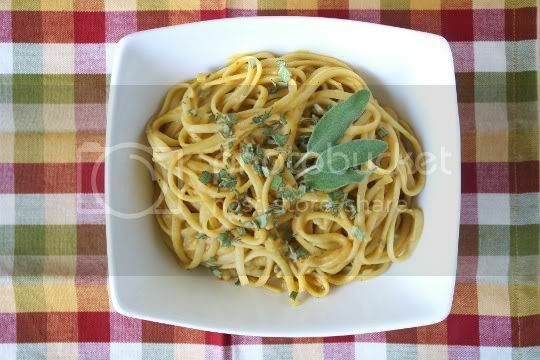 this looks effortlessly delicious; pumpkin and fresh sage on pasta... oh man, i must try this! It looks REALLY good! And I have leftover sprigs of sage from my Thanksgiving Day stuffing that will work perfectly for this. TY! I make something very similar with roasted butternut squash cubes. I add toasted pine nuts instead of walnuts both either would work very well with this flavor mix. Was looking for something quick and easy for leftover canned pumpkin. Delish! The fresh sage made it very savory. A little out of season, I know, but it will be entering the permanent recipe box. this recipe looks delicious, but it is C-R-A-Z-Y to cook the pasta *before* the sauce - all you are doing is leaving the cooked pasta to congeal, get cold and stick together while you take at least 20 minutes to cook the sauce. Never cook pasta before the sauce is ready. 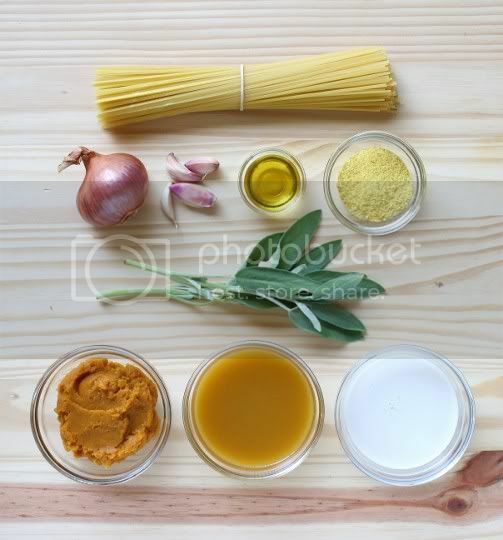 You can get the water boiling, for sure, but the time to throw the pasta into the water is when the sauce is simmering, and all that's left to do is stir it in. So good! Just made it with some gluten free pasta and it was amazing! Thanks! Thank you so much for sharing! I will have to make this tonight and blog about it as well! incredible recipe, both in simplicity and flavor. pumpkin is ALWAYS seasonal! thanks indeed for sharing. We made this tonight- even my non-veggie eaters loved it. We eat gluten free, so we used gluten free penne - great recipe, will make again - can't believe I waited 4 yrs to try it!